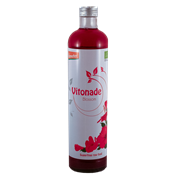 This Vitonade support, in particular the blood quality, awareness and alertness. In addition the fruit strengthen the personality and thus the self-assurance. Of course vitonade only support and complements those processes, but a base of versatile healthy diet remains necessary and vitonade can not replace this. In storable food Vitonade takes a special place because it stays fresh. The fruits are indeed fresh and raw and the beverage is not pasteurized or treated with preservatives. The acid fermentation keeps the fruit juices fresh. Regular fruit juices are always pasteurized. During the pasteurization many good qualities are lost, and this process continues as the drink cools down afterwards and is stored. In Vitonade that is not the case.